Seat, the Volkswagen-owned car marque, is launching an augmented reality app for visitors to its showrooms, to discover more about the new Leon. The free app by AnalogFolk uses the camera of an iPad, iPhone or Android-based device to highlight the Leon's features, ahead of its March launch. The app is powered by Blippar technology, which overlays information, images and video when the camera is pointed towards markers placed around the Leon. For instance, when a user points the app towards the front of the car, the app reveals details of the Leon's full LED headlamps. 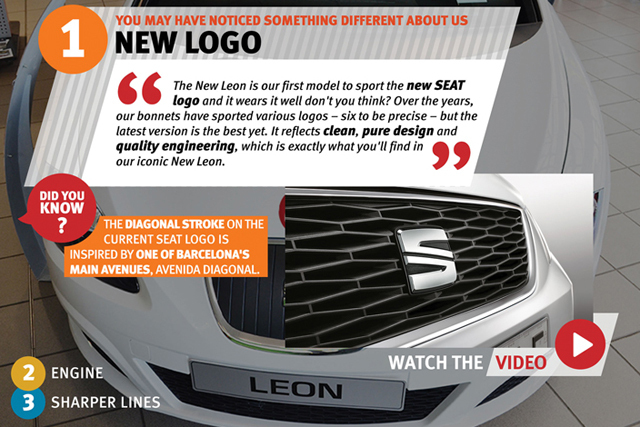 Chris Stevens, the head of marketing at Seat, said: "Given the advanced technology in the new Leon, the augmented reality experience is a perfect way for our customers to have a shared experience with our dealers in the showroom." Seat UK handed AnalogFolk its digital advertising account in May 2009. The car marque awarded its £12m UK advertising account to Grey London in November 2012 without a pitch. Its media planning and buying is handled by MediaCom.